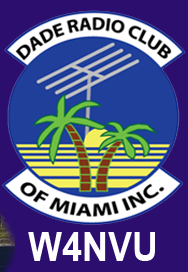 March 2013 Meeting Minutes – W4NVU – Dade Radio Club of Miami Inc.
Meeting was called to order at 19:27 with 37 present. We have a quorum. Miguel presided over the meeting and welcomed everyone. The meeting was not broadcast live on the air tonight from the EOC. There was testing being conducted in another room tonight. Everyone took turns and stated their name and call sign. Miguel welcomed everyone again. Miguel reminded everyone present tonight to sign in. We have a guest speaker via Skype tonight – Tom Morton. Miguel announced that we were having a raffle tonight of a soldering kit. One ticket for $1.00 and 3 tickets for $2.00. Treasurer – Ester advised that she recently paid the insurance for the club. No new changes in the budget. No new memberships have been paid. Membership dues are due. Please see Ester. Club Elmer/PIO – Frank is assisting with the testing tonight. Instructor – Armando – advised that he is looking for a place to hold the new Tech classes. He needs 3 Saturdays from 8 AM to 12 Noon. The last Saturday there will be testing so the time will need to be extended to 3 PM so that the test can be given. Robert said that he will check for a place. It was also suggested that we contact the UM professor and see if we might be able to hold classes there. Hamfest was discussed. Miguel said he received an email from Bill at South Florida DX Association confirming for next year and thanking us for all that we did for their club. He is looking forward to our Hamfest next year. Miguel introduced Bob Page from the American Red Cross. He is also the Regional Emergency Response Manager and a ham radio operator. Bob spoke to the group. The Red Cross needs more volunteers. When they respond to fires, they are setting up a net and need people to work as dedicated dispatchers. He needs volunteers on a rotating schedule that they can respond at any hour or work from home. They have radios that can be checked-out and will supply the equipment. The more the better. He also said that he has contact with the American Legion on Biscayne Drive. They have a huge hall and it may be available for testing. The Red Cross is working with Motorola to get coverage into the Keys. If you are interested, see Eddie or Joanne. They have his number. Carl also mentioned that the volunteers will need to be trained. Bob is also looking for anyone to begin the program from the start and if they cannot commit that they can be phased out. 147.000 – Merritt passed around parts that he is working on. He said that John did the PM on the 835 and 350, etc. He expects to have it up and running by soon. D’Star – Frank stated that he will pick it up tonight and start putting it together. He hopes to put it up soon. Miguel gave the information for the various nets this week. Miguel stated that the Hamfest will take place next year on January 31 – February 1, 2014. We have been approved as a convention. April 15 is the next Hamfest meeting. Lee advised that there is a typo in our By-Laws in Section 8, paragraph 2 – “poor” should be “pool”. If anyone else is interested, please let Carl know. He said that we will also take nominations from the floor at the next meeting. Hollis suggested that we keep the same board as last year. It was discussed that the Trustees and Directors will stay the same. The elections will take place at next month’s meeting. Website/Newsletter – Ryan – He replaced the web server with enginex and updated the data base. He is also going to update Pay Pal. Dave came in from testing. We have 3 new techs. Cesar Rodriguez; Nelson Garcia and Julio Guerra. Rene upgraded to General. Congratulations to all! Jason Swift spoke about the National MS Breakaway taking place April 20-21, 2013. He needs volunteers. See Jason if you are interested after the meeting. It will start at FIU 8th Street Campus and go to the Key Largo Holiday Inn. There will be camping at the YMCA. Our guest speaker tonight via Skype is Tom Morton W5TOM. He first showed the members present a very interesting video on antennas. He then gave us the top 10 of when you know you are an antenna. Tom then gave his very informative presentation. He took questions from the members present. Thank you Tom. John won the raffle of the American soldering kit. Congratulations! Miguel thanked everyone for coming. He reminded everyone of the elections next month and if you have any ideas for guest speakers, to let him know. The DRC meeting was adjourned at 20:35.